I’m back today with another book review. There are so many great craft books coming out lately I can barely keep up and today’s featured book is no exception! When I was asked if I’d like to review this gorgeous new book – *Crochet Loom Blooms by Haafner Linssen (*UK/Aus version is called ‘Flower Loom Blooms’) I jumped at the chance. I’ve been following Haafner on instagram for years and her feed is a feast of beautiful crochet. You should definitely check out her profile here. Go on! It will make your eyes happy! I’ve seen flower looms around before but have never been inspired to try them out but one look at the cover of this beautiful book I was instantly attracted and eager to learn more. The book is divided into four chapters, covering all the essential techniques you’ll need to start making your own blooms. Each of the 30 flower motifs are beautifully photographed with clear written instructions as well as charts for those of us who prefer visual aids. There are 5 projects included to get you started but the possibilities are endless really. All the motifs shown in the book come with instructions for joining so you can use any motif to make blankets, curtains, clothing or whatever your imagination can dream up. Itching to get started, I ordered myself a loom here. At first I was all fingers and thumbs and my first couple of blooms were a flop. But after I got through that fiddly stage I was cranking out cute little flowers like a champ. They are quick to make and a great way to use up all those little bits of scrap yarn. It’s the ‘Summer of Love’ motif. Cute, yes! I think I’ll keep going and make a cushion cover. In summary, Crochet Loom Blooms is not only pretty to look at, it is a comprehensive guide to combining two fun crafts together in a unique way. 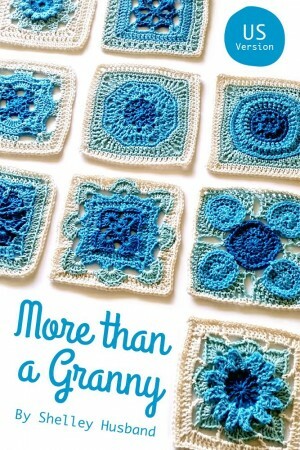 If you like pretty things or would like to add another dimension to your crochet I would highly recommend adding this book to your collection. Click here if you’d like to purchase your own copy of Crochet Loom Blooms. *affiliate links contained in this post. If you make a purchase by following my link I will earn a tiny commission which helps me keep running this blog at no cost to you. Thank you for your continued support. *I received a digital copy of this book in return for my no obligation, honest opinion. All opinions are my own. Inside you will find a fantastic variety of patterns for 100 different motifs ranging in shape from circles, squares, hexagons, triangles and other shapes. There really is something for everyone in this book! Each motif includes a clear photo, written instructions and a chart diagram. Many of the motif designs are also shown in alternative colourways which is a great feature and really highlights how different a motif can look depending on your colour choices. Speaking of colour, there is an excellent chapter on choosing colours which guides you through colour selection using the colour wheel, finding inspiration and pairing colours as well as some excellent links to ‘colour picking’ tools available on the web. This book is a wonderful resource to add to your crochet bookshelf which you will refer to time and again when planning new projects. I really liked the tip on using a photo collage app to get a sense of what your finished project will look like when all joined together. 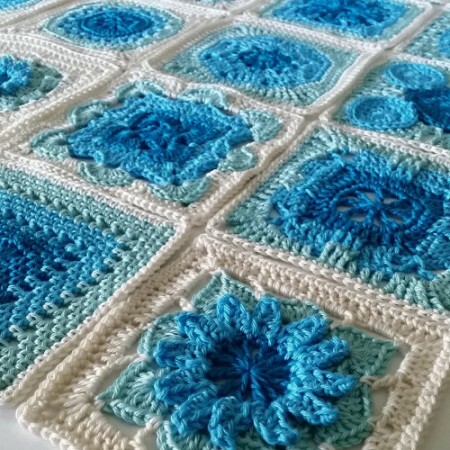 To kickstart your creativity, there are patterns 5 gorgeous projects using some of the motifs in the book. I always like to make something from the book I am reviewing. Flicking through the pages, it was hard to choose. There were so many interesting motifs I wanted to try, I didn’t know where to start! 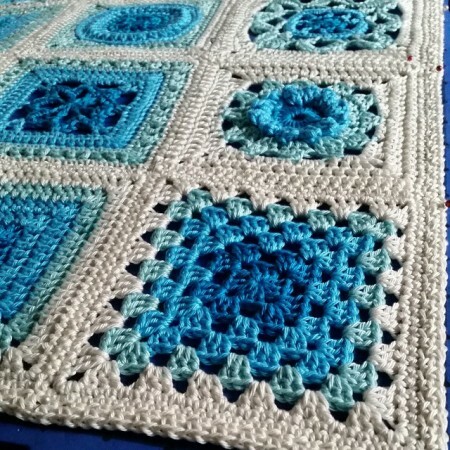 I was really drawn to the Solstice Pillow and I’ve made a start on making these squares. So eye-catching! This is a great stash-buster project! I’ve made a start with these – it’s very addictive and I’m enjoying how quickly it’s working up. In summary, Crochet Kaleidoscope is a great book and I would highly recommend it. It will make a wonderful addition to your library and I’m sure you’ll refer to it often. *disclaimer: I received a copy of this book in return for my no obligation, honest opinion. There are no affiliate links in this post. The book, published by Tuva Publishing, consists of 18 lovely patterns all worked in the round as the title suggests. Inside you’ll find a great selection of designs ranging from quick projects that can be made in an afternoon such as the coasters or mandalas or to larger projects such as a floor rug or blanket. All the patterns are well written and include colour coded charts and each project is beautifully styled and photographed with several shots showing the item in a different way including close up detailed photo’s. I really liked the Project Gallery at the front of the book showing all the projects together which is a great visual aid. Flicking through the pages, it was hard to decide which project I wanted to make! After lots of ‘oohing’ and ‘aahing’, I finally settled on the Fenced Around Wall Hanging to brighten up my studio. It was such a fun, quick project that I think I’ll make more for a few special people on my Christmas list as I know they’ll love them too! Speaking of Christmas, I also whipped up a few stars from the Stars In the Night Sky Centrepiece pattern which I think will make cute hanging ornaments. Well that’s it for me today, now I hand you over to the lovely Bec of Handmadebec for her review tomorrow. 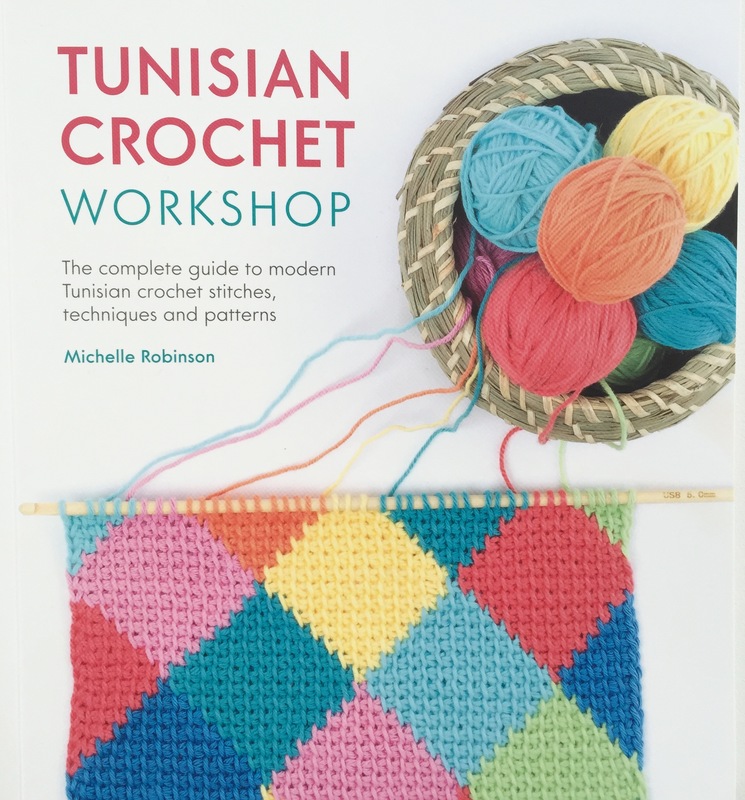 Just popping in quickly to let you know that the official promotion for my Tunisian Crochet Workshop book starts on Monday 25th September where I’ll be kicking off over on the publishers, SewandSo blog . It also happens to be my birthday that day so double celebrations and cake all round! Some awesome crochet friends will be joining me so come and join in the fun with us. Can you tell us a little about yourself Shelley? 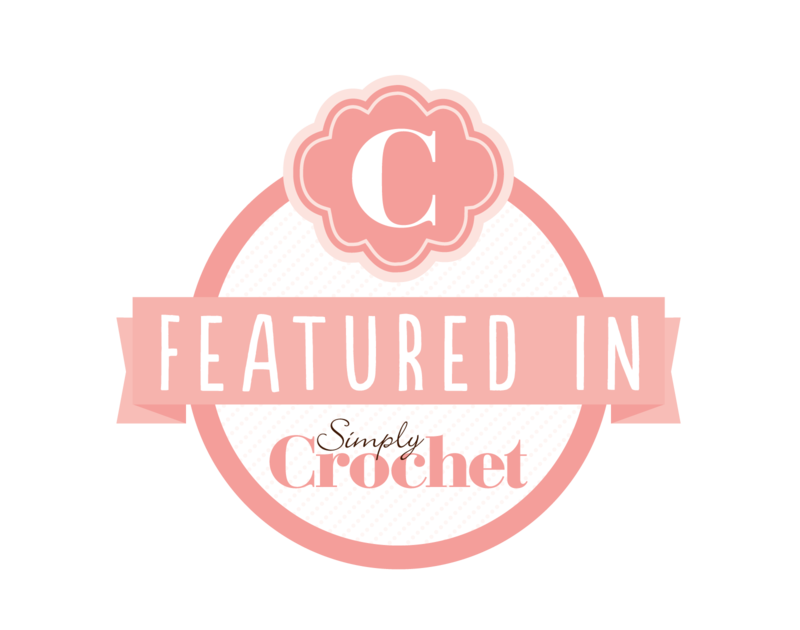 I’m Shelley and I love to design crochet squares. I live with my hubby & 3 girls in rural Victoria by the sea. I’ve always been a crafty girl, trying my hand at many crafts over the years. My current obsession is crochet, but I also knit and embroider when the mood strikes me. Inspiration for me is either there in my face or more subtle. Sometimes I have a specific idea that I must try to create, other times, I let the yarn and hook work their magic as I go with no clear aim in mind. I have designed an entire throw based around the sea. Most of the patterns for that I designed with the as I went method. After I had finished a few blocks, I realised the sea had made it’s way into them and so I decided to go with that and designed blocks with clear imagery in mind such as whale’s tails and waves. Both ways suit me. My creative process is getting more organised. When I first began crochet designs, I would randomly come up with patterns with no specific purpose. These days, I have more complete ideas and tend to see the through to fruition, attempting to finish one before moving on to the next idea. I got started crocheting when I was 10 and I helped my Mum make a granny square blanket for my new baby sister. When that was finished, I didn’t touch a hook for more years than I care to mention. I felt the urge to move on from my previous crafty endeavour about 3 years ago and turned my hands and mind to crochet. I began with a 25 pattern sampler blanket that started with a granny square and moved on to more complex designs. I really loved that process so when that was finished, I ran my own CAL over 52 weeks, sourcing patterns from all over the internet. Before that came to an end, I had started designing my own patterns. I can’t seem to stop designing now. My plans for the future include more ebooks, The next couple will be all about complete novices getting started. I love to teach others the joys of hook in hand, so my aim is to teach those who’ve struggled before to learn. I believe anyone can do it. I plan on starting with a How to Crochet a Granny Square ebook, and follow that with a book that teaches folks how to read crochet patterns and go Beyond the Granny Square. In between all the beginner stuff, I am sure I will be keeping my hand in designing more complex designs and More than a Granny will have a follow up ebook at some stage. Away from ebooks, I will be running crochet workshops locally and still designing patterns for Ravelry and my Etsy shop. Do you have any creative advice to others who are inspired but don’t know where to start? My advice for anyone wanting to get moving on their creative idea is just go for it! What’s the worst that can happen? Be prepared to break the rules, once you’ve learned them. Get out there on social media and share what you’re up to with other creative types. I love the support and friendship I have received on Instagram. You don’t have to set up an etsy shop and do it all as soon as you start. Take your time and really develop your ideas. Let things flow naturally and I am sure your creativity will show. Thanks for sharing Shelley. I love learning more about what makes people tick. 2 I like the clear layout of the book and easy to follow instructions. I especially like the stitch dictionary with ‘how-to’ video links included for those who are more visual learners. 3 The hints and tips included to help you achieve a seamless, professional finish to you work. 4 The versatility of the 20 designs. All would look equally fab together or you could select your favourite few to make stunning blankets or cushions. 5 I like that the patterns range in skill levels from easy to a little tricky. Something for everyone in here from beginner level to those wanting something a little more challenging. It really is a great addition to your crochet library and I’m sure it will be one you will refer back to often.